Michel de Nostradame was born on December 14, 1503 in Saint-Remy-de-Provence, France. His family’s roots were Jewish, but they converted to Catholicism to avoid the terrible persecution inflicted on the Jews during the Inquisition. His grandfather saw potential in the boy and taught him Hebrew, Greek, and Latin, as well as mathematics, and astrology. In 1522, he began studying medicine at the University of Montpelier and received his license to practice three years later. Like many others with academic degrees, he later Latinized his name to Nostradamus. 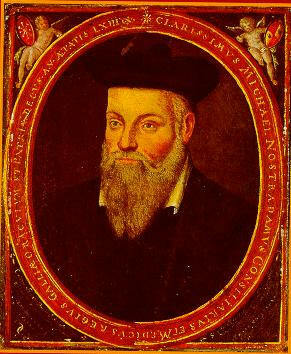 Over the next few years, Nostradamus used his training to treat victims of the plague all over France and Italy. Unlike many physicians of the time, reportedly Nostradamus didn’t rely on mercury based concoctions and bleeding his patients. Instead, he pushed for basic hygiene, fresh air, and administered a concoction made from rosehips, which though he didn’t know it is rich in Vitamin C. While the plague being the plague, many of his patients died anyway, his patients did reportedly have an above average survival rate for the time; this is not surprising as one would expect that from a physician who wasn’t poisoning his patients with mercury and then stressing their bodies further by significantly reducing their blood supply regularly. His relatively high cure rate made him something of a local celebrity and sought out healer. Sadly, his skills as a healer seem to have done little for his wife and two children who are presumed to have died of the plague. Heartbroken and under suspicion by the Inquisition for a remark he made about a religious statue, Nostradamus became a bit of a nomad for a time. Eventually, he felt safe enough to settle down, and he chose Salon in the south of France as his new home base. Nostradamus remarried, fathered six children, and began turning his attention away from medicine toward the study of the occult. His first prophetic almanac from these studies became a sensation in France, encouraging him to continue, eventually pouring all his energy into a massive undertaking he called Centuries. He wrote his prophecies in a hodge-podge of structured gobbledygook as well as using different languages in the same work, so that only the most educated could understand it “cover to cover” so to speak without someone to translate it. It is often claimed today that he did this to avoid the wrath of the Inquisition. However, Nostradamus had a friendly relationship with the Church for much of his life and as long as one wasn’t dabbling in magic, the Church had no problems with prophesying or astrology at this time. After all, the Bible is steeped with admired figures who did this sort of thing all the time. Perhaps he felt it was better to be safe than sorry or he just simply wanted to make his predictions as confusing as possible to increase the likelihood that a future event could be applied to something he said. Like many who wrote such prophetic works in his day (and really through most of history), Nostradamus was quite vague on most of his predictions both on what he was referring to and often not mentioning any dates, other than stating his predictions spanned up to the year 3797. Why the year 3797? This is something he probably read from astrologer Richard Roussat who predicted this as a possible time that the world would end. Much of his work resembling the work of others’ predictions was no coincidence. He often copied others’ predictions, sometimes verbatim. While today this would see him not only in legal trouble, but largely discredited, in his era the relatively modern idea of plagiarism didn’t really exist and copying portions of others’ works in your own without reference was very common and accepted by scholars. As now, opinions about his prophetic abilities were decidedly divided in his own time. Some people thought Nostradamus was an agent of the devil, others a garden variety con-man or nut job. Many professional astrologers of his day thought he was an amateur and an idiot. (The former is seemingly true given surviving evidence of some of his professional astrological work outside of his published works.) But he did have his supporters in high places as well. Catherine de Medici, the Queen of France, appointed him Counselor and Physician-in-Ordinary to King Henri’s court. Supposedly Nostradamus warned the King to avoid jousting (Just generally good advice). Three years later, he really did die when a lance pierced his eye in a jousting match and the wound ultimately became infected. Nostradamus was plagued with arthritis and gout for most of his adult life. In his final years, he developed edema that led to congestive heart failure. In June 1566, he had his Will drawn up. On July 1, he called for the local priest and asked to receive the Last Rites. Depending on the account, he supposedly either told a close friend or his secretary that he would not awake the following morning. If he really said that, he was correct. Nostradamus died in his sleep sometime during the early hours of July 2, 1566. Sigh! Yet another effort to mislead young readers with anti-Catholic errors! That is the modern “persecution” — a persecution OF the Church by anti-Catholic writers at “Today I Found Out” and elsewhere. How sad! First, there were various several tribunals known as “inquisitions” through the centuries, in various countries — for varying reasons, and of varying mildness or severity — not just one massive “Inquisition,” for just one purpose. Second, as has been admitted by some fair-minded, non-Catholic researchers in the 20th and 21st Centuries (e.g., historian Henry Kamen), the Catholic inquisitions were MILDER courts to have to deal with than secular ones — whether in predominantly Catholic or predominantly protestant countries. Members of the public WANTED to be tried by inquisitions, rather than by secular courts. Across the centuries of the inquisitions, the annual average number of people severely penalized was small. It is FALSE to say or imply that there was a “terrible persecution inflicted on the Jews” throughout Europe — in order to punish them, to force them to convert to Christianity, etc.. The single biggest problem that the inquisitions tried to root out was heresy (committed by Catholics). At that point in the history of the “western world,” the church and the state (kings/queens/emperors) were closely linked, so the presence of heresy was taken as a sign of political rebellion. Thus, the Jews who were investigated by inquisitions were NOT those who remained Jewish and devoutly practiced Judaism, but rather those who pretended to be Catholics while actually disbelieving Catholic doctrine.